Ms Francesca Bartolo is an Insurance Regulatory Advisor within the Insurance and Pensions team of GANADO Advocates, working closely with the legal team and with focus on re/insurance and pensions regulation and corporate matters. Francesca advises the firm’s clients on regulatory matters in relation to insurance and reinsurance companies, insurance intermediaries and captives, and also assists clients in general corporate matters. 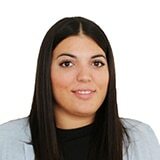 Ms Francesca Bartolo is an Insurance Regulatory Advisor within the Insurance and Pensions team of GANADO Advocates, working closely with the legal team and with focus on re/insurance and pensions regulation and corporate matters.